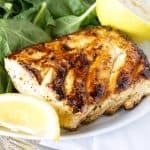 Easy and delicious grilled halibut recipe with honey and lemon will have you falling in love with fish for the first time, or all over again! Enjoy a healthy and delicious meal ready in just minutes! The trick with fish is to not overcook it. It is done as soon as it can be flaked with a fork. Get it off the heat as soon as it turns white. This particular marinade is great on lots of different fish, but halibut will always be my favorite. It is mild in flavor and brings out the delicate flavors of the fish. Serve it with a spritz of additional lemon juice for that extra hit of acidity. PRO TIP: When purchasing fish, including halibut, always ask to smell it first. It shouldn’t smell fishy or ocean-like at all. That’s how you know you’ve got a good piece. Fish that is frozen should be eaten as soon as it is thawed. Is halibut a good fish to eat? When it comes to healthy eating, halibut is a great addition to a healthy diet and is full of omega 3 fatty acids. For those who are concerned about sustainability, Atlantic Wild Caught Halibut is on the do not eat list as the stock is depleted, while Pacific Halibut is okay. What fish is most similar to halibut? Halibut is an oily white fish. Similar white fishes that can be substituted for halibut include fluke, flounder, and turbot. 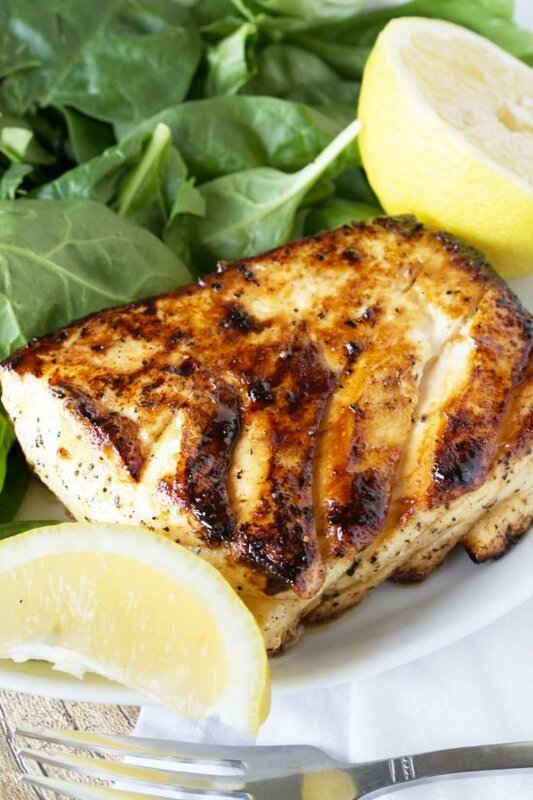 For halibut steaks, cod or striped bass are also acceptable substitutes. Watch the video to see just how easy it is to make this tasty fish. If I could eat this every day, I would! It’s simply, delicious, and good for you all that the same time! You can also check out the rest of my cooking videos on my YouTube Channel. There’s more than 150 restaurant quality recipes you can easily make at home. Enjoy a healthy and delicious meal ready in just minutes! 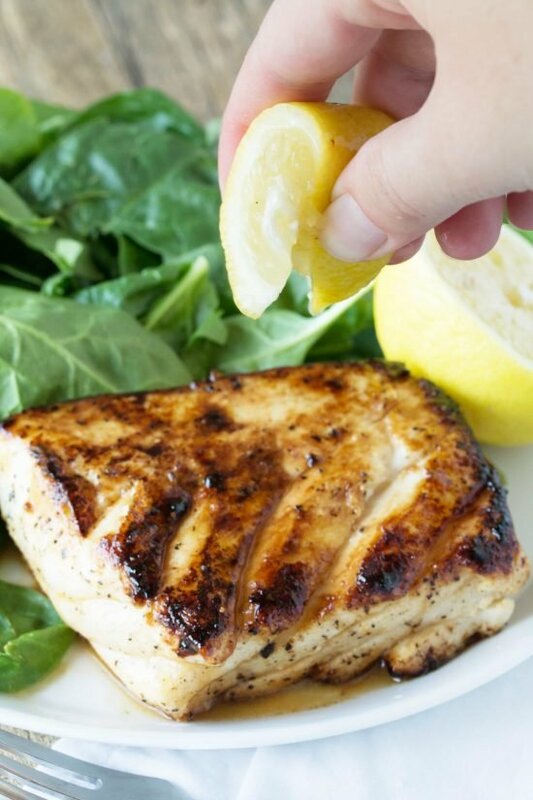 Easy and delicious grilled halibut with honey and lemon will have you falling in love with fish for the first time, or all over again! In a small mixing bowl, combine the butter, honey, lemon juice, soy sauce, pepper, and garlic. Portion your halibut by cutting it with a sharp knife into 3 or 4 pieces. A serving size of fish is 3 to 6 oz so portion it depending on the particular size of your filet. Brush both sides of each with the liquid mixture. Heat pan until it is sizzling hot (a drop of water sizzles and immediately evaporates when it hits the pan. Sear the halibut for 90 seconds on each side. Reduce the heat to medium and cook each side for an additional 2-3 minutes, until the fish can be easily flaked with a fork. Excellent light clean taste. I highly recommend it! OMG!! Not only was this recipe quick & easy but it was DELICIOUS!!! My fish store was out of Halibut so I bought some Sea Bass…it was such a hit with my family. Not a scrap was left!! The only substitute I made was I split 1 tablespoon of butter & 1 tablespoon of olive oil since my daughter is a health freak and I didn’t want it to taste too buttery. Can’t wait to try some of your other recipes soon! Made this tonight in my cast iron skillet. Turned out perfect. Thanks for a super easy, tasty recipe. Ok – could not figure out a way to just leave a comment without signing up for emails but I have to agree. The sause for the fish will be great for other fish recipes so I have printed this to add to my personal recipe box….THANK YOU!!! Amazing recipe and so easy! We actually had all the ingredients on hand and usually do because they are staple items. We used halibut one night and my husband requested the recipe again tonight with white seabass. Thank you!! Super tasty recipe! We can’t do dairy so I used oil instead of butter in the recipe, I let the fish soak in the sauce for about 30 minutes before cooking, and then I made a reduction with the sauce after the fish was cooked. Everyone loved it! I took a chance and grilled the halibut. My grates were well oiled and I used a spatula to turn the fish over only once. It came out perfectly and I got the highest compliment from my wife. Thanks for sharing this great recipe. Great recipe I deckhand for a charter boat and got my own halibut on the first day today tried this and it’s amazing nothing beats fresh clubbed halibut n this recipe.. Sorry, I never watched the video until today…..It clearly shows the basting. I only read the recipe the first time, and it does not say to baste the fish. Really a great way to cook halibut! Great recipe, except you neglect to say, save the glaze and brush it on while fish is cooking. Even still,it is the best halibut recipe ever. Going to make again tomorrow. My husband, a gourmand and a lover of fresh fish (we live on the coast of Maine) said this was the singular best piece of fish he has ever had. We’ve been married almost 30 years, and we eat seafood weekly, so thank you! Such fun to have him so delighted over a meal that took minutes to make! We had Halibut that was caught on Friday, and this is our first Easter without children home, so the pressure was on. Great recipe! Would like to try this , can we use a Reg frying pan. Depends on what you mean by a regular frying pan. Stainless steel? Nonstick? Aluminum? Cast iron? You can do it in many different frying pans. Grape seed oil, regular frying pan. Brag instead of soy turned out amazing. So you mean Briggs Apple Cider Vinegar? I’m looking for a substitute for the soy sauce as it’s not my favorite! Thanks! Tasted delicious, but the honey in it burnt on my cast iron pan and I can’t get it off. Any suggestions for rescuing my pan without having to strip it and reseason? !